The Abaco Adjustable Display Rack is designed for displaying finished slabs. It is constructed of two symmetric four-layer tiers joined by two cross rails which are adjustable from 43 1/4" to 74 3/8" to accommodate any size slab. The two additional rails at the base add stability and provide extra support. Four self-locking swivel casters allow the Rack to be moved with ease. 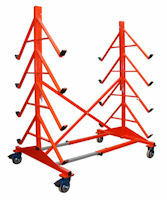 The Display Rack can be completely collapsed or folded for storage when it is not in use. This Rack is ideal for displaying finished slabs in your showroom or at shows. ¹ 160kg Per Branch; 1280kg Total.